Chester Cheetah is one of the most iconic mascots in the snack biz. But Chester himself has often openly questioned why the hell he’s appearing in commercials for cheese puffs. Here are five such commercials you’ll undoubtedly remember from when you were a kid. Chester made his debut commercial appearance in 1986 and immediately questioned what the hell he was doing there. The spot shows a group of snackintists hard at work on new crunchnology when Chester bursts through the door and shouts, “Things are about to get a little CHEESY in here!” and begins shredding on his mouth-shaped electric guitar, knocking over the Cheetoizer 2000. He says the tagline “It ain’t easy bein’ cheesy” as electricity shoots from the damaged machine. 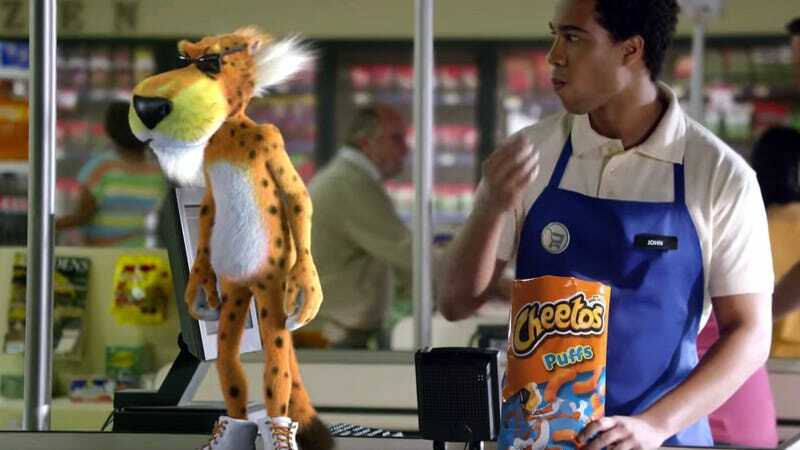 The commercial’s tone then turns on a dime when Chester begins asking the scientists in a measured, polite voice if they can think of any reason why he, a cheetah, would be in a Cheetos ad. The animated scientists simply freeze, as if the animators had stopped animating them, but Chester continues: “I mean, is it the ‘chee’ thing? Like, chee, cheese, chee, Cheetos, chee, cheetah, I get it, but it just seems like that’s not really enough to go with a cheetah. And also, are cheetahs really an animal you think of as sort of party dudes?” At this point, the commercial ends abruptly. If you watched after-school shows in the ’90s, you’re going to remember this one. An unnamed Chester impostor, who looks just like him aside from the fact that he’s green instead of orange, has infiltrated Cheetos HQ to get his cheesy hands on the secret recipe for Cheetos Paws. Chester catches him in the act, leading to a humorous scene where both cheetahs believe they’re looking at their reflection in a mirror. While the expectation is that Chester is about to lay the smackdown on his imposter for his attempted robbery, Chester instead uses the opportunity to ask his fellow cheetah what the hell is going on with the whole cheetah-in-sunglasses thing. “Can I ask you something,” Chester urgently asks his doppelgänger. “What do you think is the deal with the cheetah thing? Does that relate to cheese somehow? A cheetah is a majestic animal known for its speed and hunting prowess. Cheetahs don’t eat cheese, they don’t produce cheese. There’s nothing to do with cheese snacks there.” While Chester continues with his questions, the impostor slides down a tube and slips away with the Cheetos Paws recipe. This commercial aired around Christmas in 2008, and it depicts a sweat-drenched Chester hard at work in a volcano gathering the lava used to flavor Flamin’ Hot Cheetos into buckets. Suddenly, the volcano’s gate slams behind him. The face of his nemesis, Flamin’ Hot Fiona, appears on a monitor, and she cackles with laughter as the lava levels begin to rise. Chester calmly turns to the camera and says, “I mean, with Captain Crunch, the name of the cereal is Captain Crunch. That makes sense. The cereal is called Captain Crunch, so the mascot is a captain named Crunch. But in my case, I’m a cheetah named Chester. And I wear sunglasses and I’m, like, a really cool guy. I just don’t get it.” Finally, the lava engulfs his mouth and he stoically burns to death.